Chemotherapy is the treatment of disease by using chemical agents that are toxic to cancer cells. procedures such as surgery and/or radiation therapy, but in some cases it may be the only form of treatment needed. Chemotherapy is most often given by injection, but in some instances it may be given in the form of pills that can be swallowed. The injections are performed as either quick injections into the patient’s vein (intravenous; IV) or muscle (intramuscular; IM), or as a slow IV drip. In rare cases the injections are performed as slow IV infusions over one to two days. The primary goal of treatment is to improve and extend each patient’s quality of life for as long as possible. A veterinary oncologist will provide pet owners with detailed information about the success of chemotherapy at the initial consultation. In general, the success rates of chemotherapy alone or chemotherapy combined with other procedures vary depending on the type of cancer and the patient. How long are pets typically given chemotherapy? The number of treatments given depends on the type of cancer, the chemotherapy protocol and the pet’s responsiveness to treatment. There are various protocols available, and the success and prognosis associated with each protocol differ. In a few cases, long-term maintenance chemotherapy may be recommended. Most chemotherapy is administered on an out-patient basis. This means pets will spend several hours during the day at our hospital but will not need to stay overnight. Cancer treatment can be expensive. Pets will be receiving care from highly skilled staff and will benefit from board-certified specialists with years of training and experience in oncology. The cost of treatment depends on many variables including the cancer type, chemotherapy protocol, patient size, treatment duration, and any necessary hospitalization or additional procedures. There also may be a need to amend the chemotherapy protocol depending on the pet’s response to treatment. A written estimate will be provided for all of the known treatments and procedures. How does chemotherapy affect a cat or dog’s routine care? A pet’s daily routine should be as normal and uninterrupted as possible. Pet owners should continue giving their pets heartworm, flea and tick preventives. Because chemotherapy affects the immune system, annual vaccinations need to be discussed with the oncologist prior to administration. We will also consult with the family veterinarian regarding vaccinations. It may be necessary to limit interaction with other sick pets at certain points following chemotherapy if the immune system is compromised. Pet owners should consult with their oncologist about specific health conditions and any medications their pet is taking. Almost all chemotherapy agents have the potential to induce side effects, but they would not be used if their potential benefits did not outweigh the possible risks. Unlike people receiving chemotherapy, the vast majority (80-90%) of dogs and cats have minimal to no side effects. However, a small number of patients may have moderate to severe side effects. Rarely is a side effect life-threatening to the patient. Chemotherapy side effects occur as a result of the toxic effects that chemotherapy agents have on the normal cells in the body. The majority of the normal cells that may be affected are found in the lining of the intestines (GI tract) and in the bone marrow. There may be other specific toxicities associated with various chemotherapy agents on particular organs, and these will be discussed when indicated. The common side effects associated with the GI tract include vomiting, diarrhea and nausea/loss of appetite. The common side effects associated with the bone marrow include a decrease in the white cell count leading to immunosuppression (a compromised ability of the body to fight infection), loss of appetite and lethargy. It is rare to affect other bone marrow-derived cells such as the platelets and red blood cells. Many side effects, such as those associated with the GI tract, are not immediate and become evident three to five days after chemotherapy. In the majority of cases the side effects are limited to no more than 24 to 48 hours. The white cell count is typically at its lowest point 7 to 10 days after treatment, and the cells naturally rebound quickly. If needed, medications can be administered to counteract these side effects. Chemotherapy breakdown products are eliminated from the body through the urine and/or feces for 24 to 48 hours after administration. Please use good hygiene when cleaning your pet’s waste – wear latex gloves and wash your hands after cleaning urine, feces and vomit immediately following treatment. Women who are pregnant or nursing should limit exposure to chemotherapy and waste products. The excreted compounds are not airborne, so there is no harm in being around an animal who is panting, and there is miniscule risk with coming in contact with saliva. Wear medical latex gloves (available at your local pharmacy) if handling any chemotherapy pills. Never open capsules, and do not crush tablets as they have a protective coating. You may place pills in a small ball of food, peanut butter, or cream cheese to tempt your pet to take them. Most animals tolerate treatment very well. Those who have problems usually do well with adjustments in the dose or schedule of their treatment. It is important for you to have an understanding of the effects of the drugs so that minor problems can be managed, and major ones recognized early and brought to our attention. Withhold food and water for 12 hours. After fasting, offer ice cubes, then water, then small bland meals such as boiled chicken and rice. Call our hospital if the condition persists. Medication may be dispensed to help. Call our hospital if the vomiting persists. Keep water available at all times, unless your pet has been vomiting. Add rice or sweet potato to the regular diet. 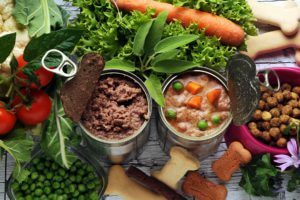 Do not change your pet’s diet, unless instructed otherwise. Sometimes changing or modifying the diet may cause diarrhea. Call our hospital if the diarrhea persists, worsens, or if your pet has bloody or black tarry stool. Medication may be dispensed to help. 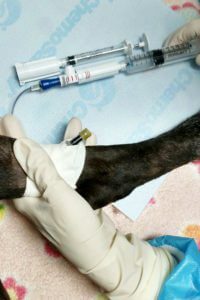 Chemotherapy is the cornerstone of treatment for many types of veterinary cancer. Our chemotherapy protocols are designed to maintain a pet’s excellent quality of life while providing the most effective therapy against cancer. 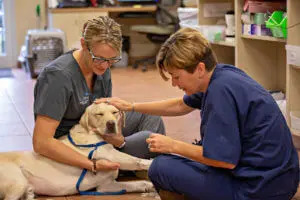 All chemotherapy appointments include physical examinations performed by the oncologist, blood work evaluation to ensure that a pet can safely receive chemotherapy, and administration of the appropriate chemotherapy drugs tailored specifically to a pet’s individual needs. This entire process may take only an hour or two but sometimes can take all day. Pets can usually go home on the same day they receive chemotherapy. For procedures lasting all day, we ask pet owners to drop off their pet, so we can treat their pet during the day and have them ready for pick-up by late afternoon. Our technicians will ask how a pet is doing at home and if you have any new concerns or questions. As always, the oncologists are happy to discuss any questions, concerns or changes in treatment over the phone with you. Please ensure that you provide phone numbers where we can reach you during the day. When a pet is ready to go home, we will provide written discharge instructions. If owners choose to wait while their pet is receiving chemotherapy, we will make every effort to expedite their pet’s treatment. Our laboratory provides blood work results quickly, but pet owners can plan on visits requiring at least one to two hours. 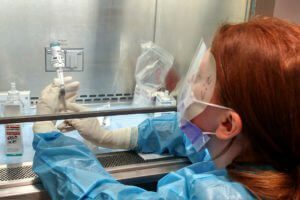 This is to allow time for the oncologists to examine the patient, review the blood work, and to then have the treatment prepared and administered by the oncology nurses.